There are times when you have a Nuke script that feature really heavy nodes that affects specific frame range and you need it to automatically disable at specific frame range after it has done its job. Problem here is that the process is not automated and Nuke will keep on processing the heavy nodes even if it doesn’t contribute to the overall rendering outside of the intended frame range. You can easily use expression at the Disable knob to ensure the nodes get disable after meeting the condition. It doesn’t have to be a CPU/GPU heavy nodes, you can use the expression to toggle any nodes when it should be disable. Although do take note that the default expression uses TCL. I’m unsure if you can use Python expression to achieve the same result but it should be not an issue as Nuke support Python. You just need to get the correct syntax and declaration for the respective script language. Let’s say you need to disable from Frame 80 onwards. Add frame > 79 to the Disable knob expression. 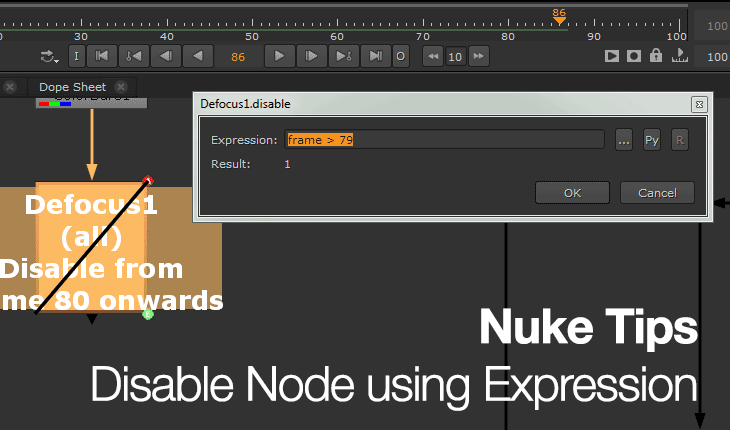 Nuke will automatically disable the node from Frame 80 onwards. You can also use frame < x to disable the node before x (where x is the frame number). You need to disable a particular frame range. This can be done using inRange ( frame, x, y ) where x and y is the start and end frame respectively. So inRange ( frame, 20, 30) means the node will get disable from frame 20 to 30. Copy and paste the following script into Nuke to see three quick samples that I created. label "The wheel rotation\nis driven by\nexpression"
label "No expression\nfor Disable knob"
label "Disable from \nframe 71 onwards"
label "The Disabled GodRays\nshould render slightly\nfaster compared to\nnon-disabled GodRays\nas Nuke still calculate the\nGodRays even though it is\nnot visible on screen after\nthe Merge mix is set to 0.\n"
label "Disable from\nframe 80 onwards"